//I am writing a program that converts from one unit like mm to another e.g cm. The program should prompt invalid unit when something other than mm, cm, m or km is entered as the unit to be converted from or unit to be converted to. The problem is how I initialize the units. When debugging, input ends the program. What do I do? cout<< "km m cm mm km m cm mm km m cm mm km m cm mm km m cm mm\n"
<< "| Welcome to Topiloe Metric unit converter |\n"
cerr<<"--> Sorry, unit to convert from is invalid\n"
cout<<"--> Sorry, unit to convert TO is invalid\n"
You need to fix all the compiler errors before you attempt to run the program. the two variables declared on line 9 are too small if you expect to enter two characters on line 21. cin will add a string null terminating character, so increase the size of the two variables by 1 byte each. You have the same problem in many other lines in that program. That means I have to declare as char init_unit and sec_unit. By calling stramp() similar to how I showed you in my last post. That would all be simpler if you used std::string instead of char arrays. This is what I have now but when I use mm or cm or m or km, it shows the invalid message and then asks me to input the valu which it does correctly. How do I tackle that part? << "|      Welcome to Topiloe Metric unit converter      |\n"
cout<<"--> Sorry, unit to convert from is invalid\n"
line 10 is still wrong -- you failed to make the correction I pointed out. The pogram isn't going to work unless you increase the size of those two variables. line 23: use && instead of ||. Let's say you enter "mm". Line 23 is going to fail because it's not "nm", so you need the && operator to say if it's not any of those strings. line 41: Think about what the && operator does, according to line 41 you expect init_unit to be both "mm" and "cm" at the same time. Not possible. You need the || operator instead of && operator. All the other lines foollowing line 41 are using the wrong && operator for the same reason as I mentioned above. I have made the change but it is meant to quit if the user enters the wrong unit. Even when I use the correct value, though it runs, it shows me the invalid message instead of the next instruction. I already told you what's wrong with it, reread my previous post, second paragraph. You have the && and || operators mixed up. Sometimes even more experienced programmers have that problem. You never answered the last question, the problem states it's supposed to be in java. I don't think so but is it possible to combine Java and C++ on the same compiler? Not that I know of. I don't know very much about java. But you might be able to use the same IDE, such as NetBeans (don't know about it either). 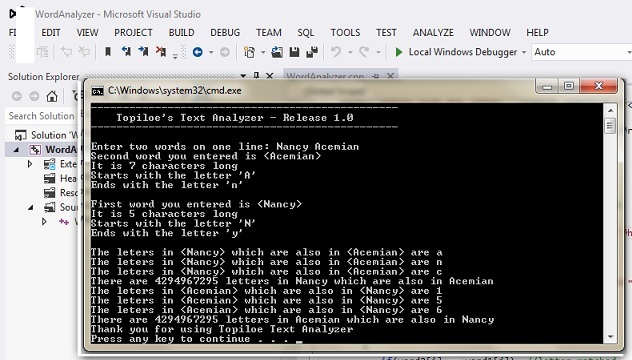 << "    Topiloe's Text Analyzer - Release 1.0  \n"
If you want all the characters on the same line then remove the newline character '\n' from the cout statement(s). You mean NetBeans? It's an IDE that's used for several different languages. This is the output I have but it should be a n c and not separating the characters. line 50 should probably be the same as line 38.